This condition (also called herpangina) is an infectious illness that results in ulcers or blisters on the back of the throat or palate. 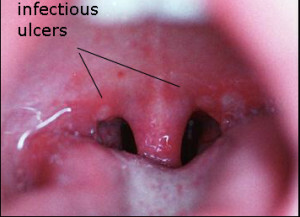 It occurs predominantly in small children and is associated with a high fever for a few days. This is an infectious illness caused by a number of viruses. These include a family of viruses called enteroviruses. It used to be thought that the herpes virus was the main cause but this has been shown to be incorrect, but the name still exists. This is extremely common illness from 12 months of age until around 4yrs. It is quite infectious. Luckily apart from some very rare cases this is an illness that is not serious. The illness will last 3 -5 days and during this time should be kept at home. The virus is excreted in the faeces and good handwashing will prevent its spread. Usually the toddler will develop a temperature, go off his or her food and appear upset when swallowing or feeding. There maybe some drooling and high fevers up to 40 degrees and he or she will appear listless. Sometimes there might be a slight runny nose and some loose bowel actions. The nighttime can be problematic as the temperature will cause interrupted sleep and the throat will be painful to swallow. Older children may complain of a headache and abdominal pain. In some cases there maybe a viral type rash on the trunk or the nappy region. What will the Doctor see ? The toddler will usually have a fever, there will be some slightly enlarged lymph nodes around the neck region or under the lower jaw. Often there is drooling. The throat will have circular ulcers, usually at the back, but sometimes on the palate aswell. See Picture. This is not the typical appearance of tonsillitis. What is the treatment and advice ? Being a virus antibiotics are of no value and should not be used. There are no specific medications that will help eliminate the infection. Most importantly is keeping the toddler comfortable. This will involve some iceblocks, ensuring adequate fluid intake and some panadol or nurofen particularly when going to sleep. This is a quite infectious illness and proper handwashing will go some way to prevent spread. If there is a sudden deterioation, it is worth getting reviewed to check there are no complications such as an ear infection. Very very rarely these viruses can have some serious complications. This equates to a handful of cases in Australia each year. They can trigger febrile seizures in those children who are susceptible.